Bad Girls: Sirens, Jezebels, Murderesses, Thieves, and Other Female Villains by Jane Yolen and Heidi E. Y. Stemple, illustrated by Rebecca Guay. Grades 5 and up. Charlesbridge, February 2013. 164 pages. Review copy provided by publisher. In brief biographies of notorious women, authors Jane Yolen and her daughter Heidi Stemple explore the women of the past and ask themselves (and the reader) if they were really all bad or if they just got a bum rap. Women included range from well-known (Lizzie Borden, Typhoid Mary, Cleopatra) to those you might not have heard of (Alexe Popova, Elisabeth Bathory). Each woman gets a 2-4 page biography and then a one-page comic that details some of the research and investigation that went into creating part of the book. The brief biographies are perfect for dipping in and out of, making this book a great recreational read for tweens and teens on the go. I loved the inclusion of the comics, illustrating some of the questions the authors faced as they wrote the book. They also help break up the text as the authors move from subject to subject. The writing is succinct and the tone of the book is light throughout. Although the nature of this book calls for the biographies to be brief, there is certainly enough there to inspire an interest in further research. The authors selected a wide variety of notorious females from a variety of places and time periods, from spies to poisoners to pirates to exotic dancers. Back matter includes a bibliography for each of the subjects in the book (hooray! ), an index, and a note on changing gender roles, which may redefine our idea of "bad" over time. This is a great book to spark an interest in women's history and introduce tweens and teens to a variety of famous and interesting women throughout history. Readalikes: I'd be quick to hand this to readers who have enjoyed Lives of Extraordinary Women by Kathleen Krull, as the format and content are similar. There is definitely room for both books on your shelves, as Bad Girls contains different content and is presented in a different format. Readers looking for more books featuring strong female characters should take a gander at the Amelia Bloomer Project book lists. 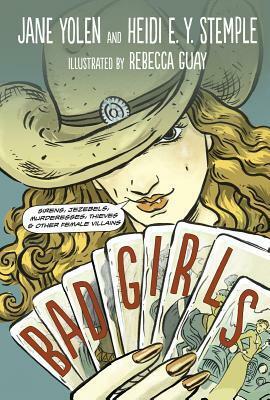 Bad Girls is on shelves now! It's Nonfiction Monday (no foolin'! ), so head on over to Wendie's Wanderings for this week's roundup.